Here at a/c professionals�we�will walk you through all stages of turning your house to a well conditioned home all year round taking�all parameters�into consideration. -Choosing the exact right air conditioner size according to a list of parameters to reach maximum air flow efficiency (CFM), during winter and summer time. (Choosing the right size air conditioning system will in fact give better results in cooling and heating, and will decrease the amount of energy used and by that decrease the electric bill). -Installing the air conditioning system after having discussed every small detail so that you - our most valuable customer will be fully satisfied. -After we finish the installation we make sure to clean all working area. Once you’ve selected the right system, it’s time to ensure its continual operating success. We offer extensive maintenance plans that take the guesswork out of keeping your system up and running smoothly. Daniel was very polite, professional, explained what he was doing and why. He also was great about advising us what to do to keep the unit clean . He Explained about what to do if we had problems or just questions. Very impressed with the whole experience.. Thank you very much! Had Daniel come in and clean and disinfect 4 A/C units. He did an amazing job took his time and made sure all units were spotless. Diagnosed and fixed VERY HAPPY! Daniel diagnosed the issue very quickly and immediately drove to get the part. We were back up and running in just a few hours. The job was done quickly and very professionally. Very pleased. Great experience all the way through , Great Job !!! On time to start , completed in a timely fashion . Daniel was absolutely outstanding. He was friendly, knowledgeable and respectful. He did excellent work, cleaned up after himself and thoroughly explained proper maintenance and care. Couldn't have asked for better service! I've already started telling my friends about an exceptional experience. Daniel and Nahum were exceptional. They were early, knew what they were doing, and went above and beyond. Very professional. called late in the afternoon, they arrived by 9am the following morning. Fixed the unit and I had cool air by 11am. Daniel and Nahum were friendly, personable, honest and very professional. I would recommend them to anyone and would use them again in a heart beat. Wonderful work. On time. Informative. Top notch service. Nice workers. Very well done. Great service! Starting with first meeting. Very comprehensive in explaining everything about it, then measuring the rooms then deciding which size to get, where to install it. I felt very good knowing everything about it all. Then when installation day arrived. It was quick, clean efficient and professional! not much to say but so glad these guys were incredibly professional and down to earth all at the same time and knew what they needed to do to work around any situations that came across. Great people to work with! OUR new unit work's GREAT!! I was very happy with the overall experience. Everything was described in detail and everything went perfectly. VERY HAPPY WITH THE OVERALL EXPERIENCE. Daniel and nahum were nice, able to answer questions we had, and what was promised was delivered.We shopped around for pricing prior and found they offer great service and a very competitive price. Process was easy, installers were prompt, informative, friendly, explained all steps when possible, and cleaned the area thoroughly before they left. Polite, prompt, hardworking, knowledgeable and even nice to the dogs. A great experience from start to end in ONE DAY! Two big units in our three story townhouse. Wow! Installed 3 units and got the job done perfectly! Clean, easthetic, and very fast. 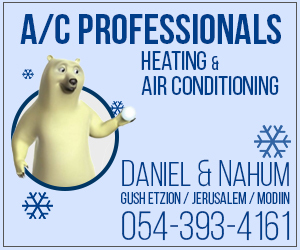 Daniel and nahum came to my house and did a very professional job installing 5 a/c at a very reasonable price. They did it fast and clean and were very pleasent to work with. Daniel and Nahum got the job done perfectly. Couldnt ask for any better. Kind service, very neat work. Just purchased a new home and needed A/C installed. I called A/C professionals and I'm very happy I did. They were professional, reasonable, on time and they did an absolutely amazing job. They treated my home like it was their own, cleaned up after them selves and were very personable! Thank you guys very much. I will definitely recommend you to all my friends!